Let your creativity shine with this reversible butterﬂy motif and two matching borders. 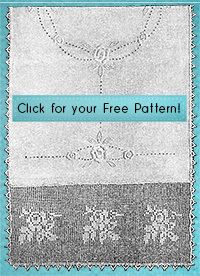 Designed by Cecily Palmer and Eveline D. Johnson in 1940, you can use this pattern to make a bedspread, tablecloth, or curtains. Children are always interested in animals and birds, and your little one will be delighted with a “zoo” bedspread. Designed by Mrs. A.J. Lavender in 1918, these simple blocks will fuel your creativity.